In our ‘Year of Growth’, we are moving towards a much ‘brighter’ future thanks to the installation of new lights throughout the school! For over 25 years the florescent lights in the classrooms and administration building have been serving our needs, but over the last few years they have been a cause for concern, as they were starting to become a maintenance and safety issue. The old plastic on these florescent units were at times so brittle that they fell apart during routine maintenance. Some of the units were not working at all, not to mention the fact that they were not even switched on at most times, to simply avoid the constant buzzing annoyance and sound coming out of them. Thanks to the support and foresight of the School Board the issue was resolved and a plan of action was put in place for this major and costly capital project. 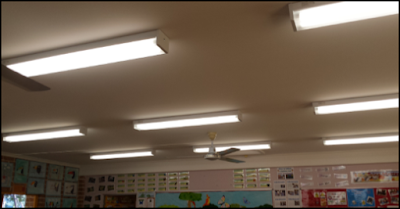 The issue was not a simple replacement of the lighting units, but a plan for the future with a more robust, modern and environmentally friendly system that will serve the needs of the school well into the future. Therefore, the solution to replace 106 light fittings required careful research and planning. Once again, it was one of our graduates who came in to assist and ‘serve’ the school they graduated from in the year 2000. Our graduate of the new millennium, Garen Manoukian, the owner and proprietor of ‘Impedanz Electrical’, recommended the installation of the latest LED light tubes that not only use 50% less energy than the florescent equivalent but also last much longer with potentially zero maintenance. The fittings are also placed in a full metal chassis with screws in the end caps, making them much safer and robust. The new lights have now been installed in two classrooms that were affected the most. The Board has also used this opportunity to apply a new and fresh coat of ceiling paint, which was done during the holiday period. The rest of the lights will be installed during the next term break. The ceilings will also be painted in the process, allowing our students to be invited into a much brighter, safer and environmentally friendly classrooms. On behalf of the students and teachers, I like to take this opportunity and thank all Board members for their support. It is gratifying to know that we have members who are not willing to compromise the safety and wellbeing of our students and staff at any cost. For this, we also like to acknowledge our business partners and sponsors who continue to support the school. Without their financial input it would not be possible to implement these type of capital projects, which in this case is anticipated to be over $11,000.